The new Q'nique 21 sit-down version lets you take full advantage of the 21 inch throat-space the longarm quilting machine offers, without sacrificing space in your quilting room. The sit-down table is loaded with features and combined with great price that make it a value that can't be beat. 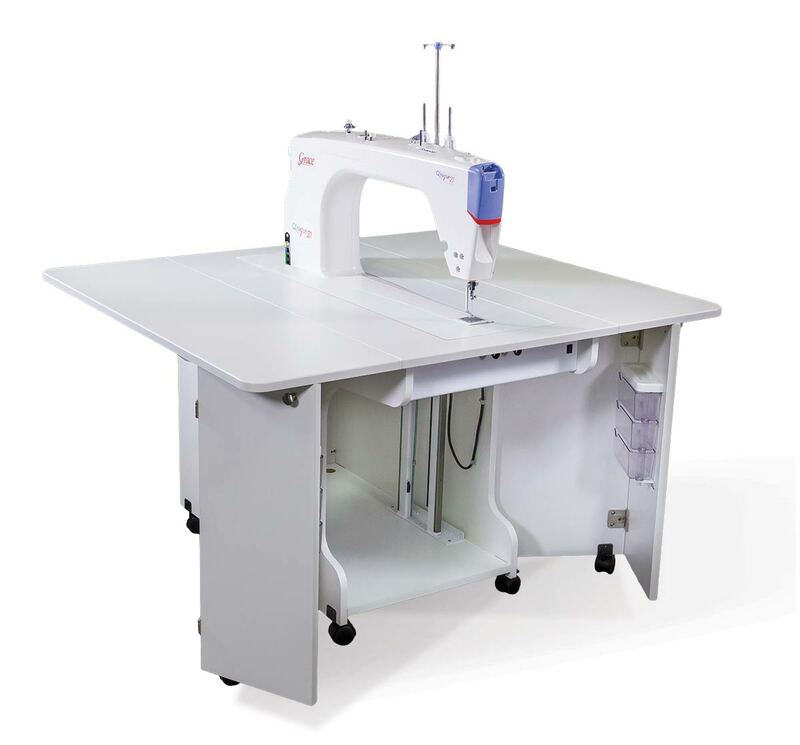 The 21 inch throat space makes this the largest available sit-down quilting machine in the market, and this is currently the only longarm sit-down table featuring an electronic lift, letting you retract the machine into the table so you can use the surface for other projects. With the electric lift in the Q'nique 21 Sit-Down table, you can raise or lower the machine with the simple push of a button. The Q'nique 21 is currently the only longarm sit-down in the market that lets you completely retract the quilting machine into the table, letting you the large table surface for other projects. The sit-down quilting table will save the position of your quilting machine, so when you're ready to bring the machine up to quilt, the auto-stop positioning gets the machine right where it needs to be. With the push of a button, you can raise the quilting machine above the level of the table surface, giving you easy access to bobbin. When you're not quilting, the machine can be lowered and stored in the table. The table comes with a surface-cover that perfectly fills the hole and converts the table into a cutting or crafting station ready for your other projects. The sit-down version of the Q’nique 21 longarm includes a multi-function foot pedal. Besides controlling the stitching speed, you can press the “back kick” button to raise or lower the needle. You can even change the default needle stop position by holding the back kick down for three seconds.